I’m currently on my year abroad in Frankfurt, Germany, as I study German and Business Studies at uni. Almost everyone who has been on a year abroad will tell you it was the best year of their life. Well, it definitely has its ups and downs! I’m on placement here and though I enjoy my job and my colleagues are lovely, I don’t know many people outside of work, which means this year has been pretty lonely. Luckily, I do live with two people who I get along with really well but they’re often busy or away. I’m asked a lot if I wish I’d gone to university in Germany instead of doing a placement, because then it probably would’ve been easier to make friends, and the honest answer is no. It’s certainly been hard being on my own a lot but I feel as though working has given me skills that I can use in jobs in the future. I mostly do admin work for one project in the company but I also translate on occasion and I often proofread. Though that might sound boring, it’s interesting as colleagues usually like me to sit with them and proofread the documents with them, so that they learn where they’ve made mistakes. That way, I also feel like I am helping more, which is always a good feeling! Also, the admin work has been tasks such as taking minutes of meetings and I’m responsible for sending all documents to the customer. So, what I do is actually relevant and required. Although my year abroad has had its low points, it’s also been a major confidence booster for me. I now know that I can work in a foreign country, speaking a second language! I used to panic whenever I had to speak German and now I don’t at all. I’ve noticed a big improvement in my ability and other people have commented on it too. Another bonus is the fact that we’ve had some lovely weather here, not like at home! 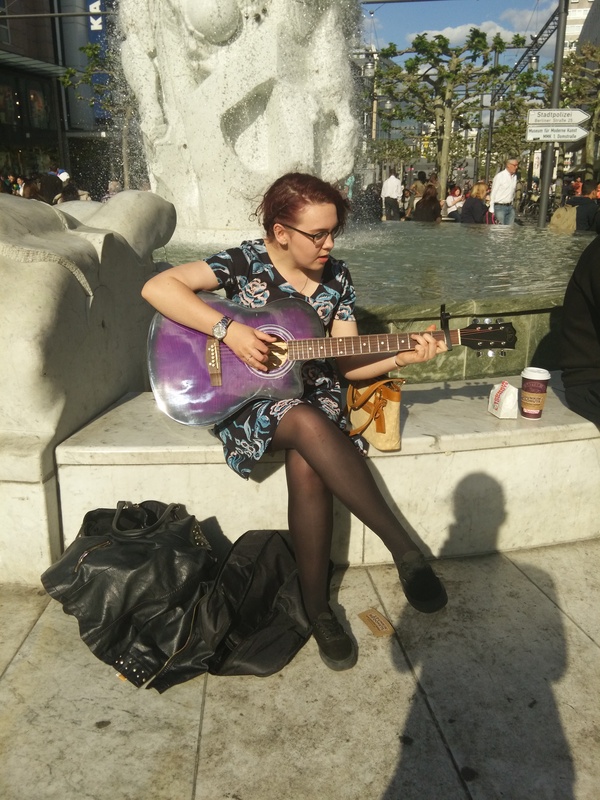 I actually said a few weeks ago to some colleagues and my flatmate that I wished I could play guitar outside in the sun, so they jokingly told me to play in the city centre because there’s quite a few people here who do that. So, I did! I’ve played a few times now and I really enjoy it. Not only is it nice to be able to play in the sun but people come up to me and talk to me, which means I get to practice speaking German in a different environment than work. I go out with my guitar now almost every chance I get and people always talk to me, which is a great way to feel less lonely and forget about the homesickness! I only bought a cheap guitar when I moved over here, as my plan was to leave it here when I go home but I’m actually going to send it to England because I want to keep it for the memories. All in all, even though my year abroad has had its down sides, it’s been an experience that was absolutely worth it and was definitely beneficial. On Saturday 11 July the University of Liverpool and National Museums Liverpool will be hosting at the Museum of Liverpool. This public event marks the culmination of two initiatives inspired by the Decade of Health and Wellbeing: NML’s annual ‘House of Memories’ programme of activities, and the University’s project ‘Cinema, Memory and Wellbeing’, carried out by Dr Lisa Shaw (Department of Modern Languages and Cultures) and Professor Julia Hallam (Department of Media and Communication Studies) in collaboration with the Rowan Garth BUPA Nursing Home in Anfield and a health centre in Petrópolis, Brazil. 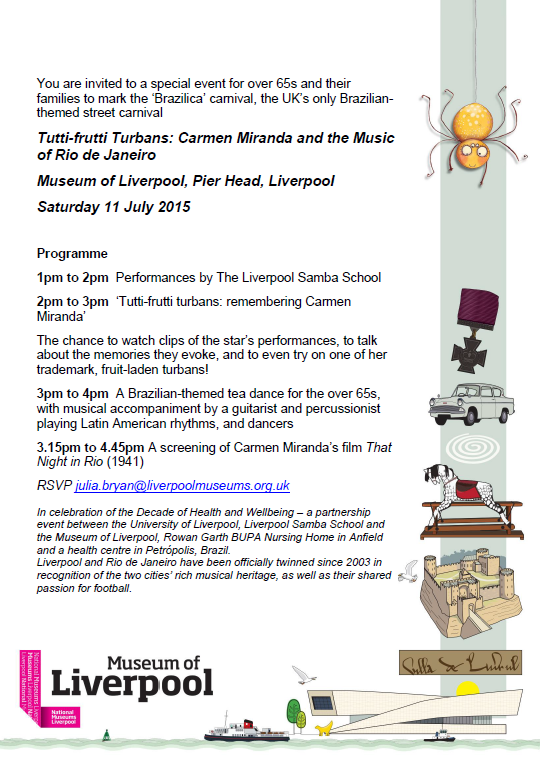 The event also promotes the ‘Brazilica’ carnival, the UK’s only Brazilian-themed street carnival, to be held in the city from 17 to 19 July, and celebrates the fact that Liverpool and Rio de Janeiro have been officially twinned since 2003 in recognition of the two cities’ rich musical heritage, as well as their shared passion for football. It also reflects the University of Liverpool’s long-standing international profile in the area of Brazilian Studies and increasing number of Brazilian students. 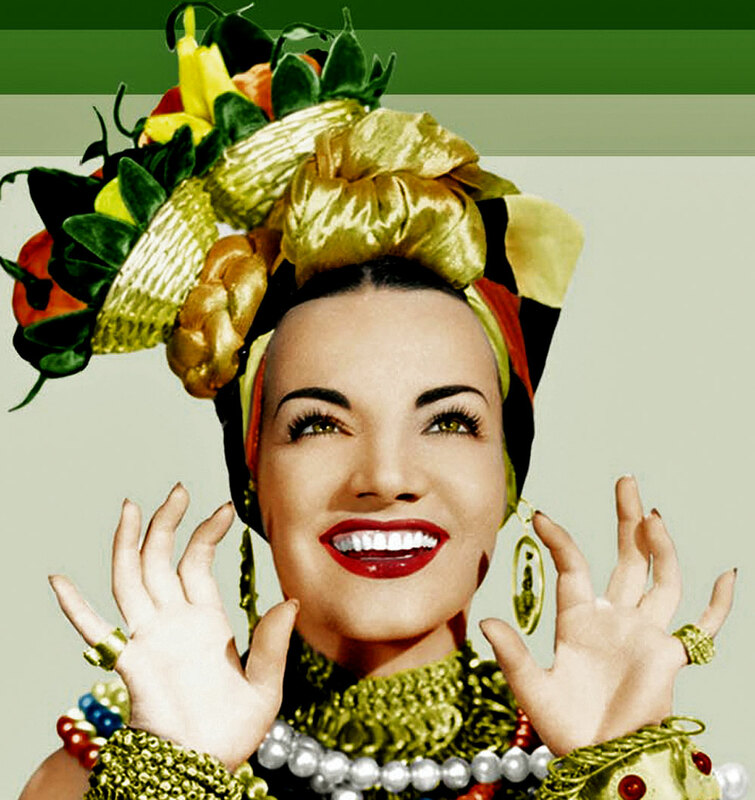 In addition to live performances of Brazilian percussion by the Liverpool Samba School and a screening of Carmen Miranda’s film That Night in Rio (1941), the event will include a Brazilian-themed tea dance for the over 65s and the chance to watch clips of the star’s performances, to talk about the memories they evoke, and to even try on one of her trademark, fruit-laden turbans.